The age old question,”How many cubicles do you need?”. The number of cubicles you can fit in a space varies on a number of factors listed below. Hopefully after reading this you will be able to determine how many cubicles you actually need. This article could also help you in selecting a future office space. 1. How many employees do you have. If you have 30 employees you wish to seat in office cubicles you will obviously need at least 30 cubicles. Now, if your company is growing you will want to allow room for growth. We recommend leasing an office space so you could either take additional space adjacent to the space you are leasing or if you are growing quickly simply lease additional space at that time. Allow for up to 10 new cubicles to be installed per year. 2. What do your employees do? A cubicle fit for a high end sales team is not the same as a call center or a marketing team. Know what each of your employees does so you can customize their cubicles accordingly. If you don’t want to play favorites we can help you find something that suites everyone. 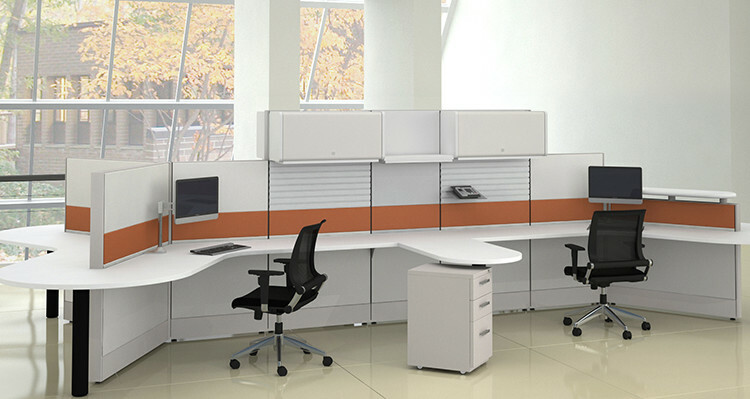 The design of the cubicle will determine how may cubicles can fit into your space. You need to know what cubicle design / office design you are after before you lease office space. 3. What size cubicle do you want? As mentioned above different workforce roles call for different cubicles however, most companies are looking for a certain average size cubicle. We can say that we sell more low wall, 6X6 cubicles than anything else. Low walls ( anything from 53″-48″) allow for additional light to permeate your office creating an open feel while the size of the 6X6 provides just enough room for your employees to move around and feel private. 4. What style of cubicle are you wanting? Style is one of the most subjective cubicle buying terms and it varies greatly depending on your company brand and what you do. There are contemporary cubicles, open plan cubicles, benching cubicles, tiled cubicles, cubicles with doors, glass cubicles, modern cubicles and more. The style is also influenced by the colors you choose. If you’re going for a contemporary office design you will stick with lighter colors, neutrals and whites. The style also determines the layout of the cubicles. Different styles can have different layouts. Example: an open office design will have more teaming cubicles, teaming cubicles take up more office space than call center cubicles. You will want to know the style of cubicle before you select an office space. We hope this article was helpful to you. If you would like a custom floor plan to know how many cubicles we could fit into you space please chat online or contact us today. We would love an opportunity to work on your cubicle project. We offer free space planning and design to all customers. No Comments on "How Many Cubicles Do I need?"